More than 1,000 cars, most felled by potholes or the maneuvering of the state’s less-than-celebrated drivers, fill the grounds. Planes drone over the tangle of highways just outside the fence. And overhead, the Pulaski Skyway towers. On Saturday, northbound traffic on the skyway will be shut down for an estimated two years for a reconstruction project, severing a critical link for roughly 40,000 vehicles in and around Jersey City and Newark and complicating commutes to New York City for those who use the bridge to reach the Holland Tunnel. The integrity of the structure, which opened in 1932, has grown increasingly worrisome in recent years, officials said; its roadbed and concrete railings are so frayed that the state installed netting to catch the falling debris. The skyway has also attracted attention in recent months because of the George Washington Bridge lane-closing scandal, which has shined a light on Gov. Chris Christie’s opportunistic relationship with the Port Authority of New York and New Jersey. In 2010, Mr. Christie ignited a controversy when he canceled construction on a rail tunnel beneath the Hudson River and claimed billions of dollars in planned Port Authority spending as New Jersey’s money. Much of that money is being used to pay for the Pulaski reconstruction, which is estimated at more than $1 billion, including more than $300 million for the work during the two-year shutdown. 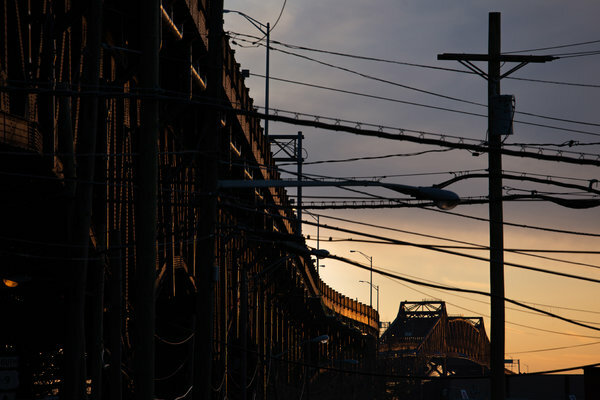 And so, more than eight decades after its opening, the Pulaski Skyway has achieved a singularly New Jerseyan celebrity: It is an impending traffic nightmare, infused with political machinations. Named for a mustachioed general of the American Revolution and immortalized during the opening sequence of “The Sopranos,” the crossing has come to occupy a special place in the state’s collective consciousness. Roughly 40,000 vehicles take the skyway north each day, and it is a popular route for drivers heading to New York City by way of the Holland Tunnel. 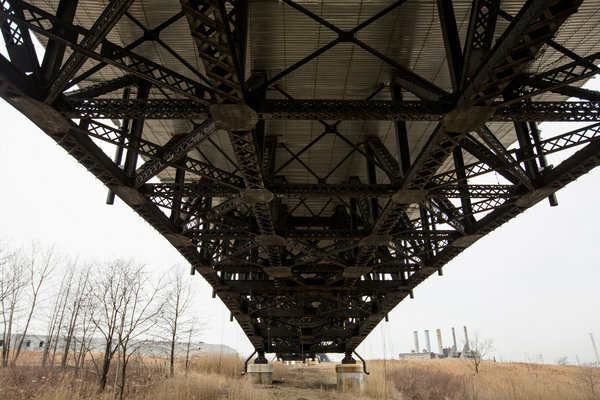 It is not just a rickety bridge, residents say, but their rickety bridge, three-and-a-half miles of steel that has passed its prime, gently rising up above the Meadowlands of New Jersey and dropping down again. 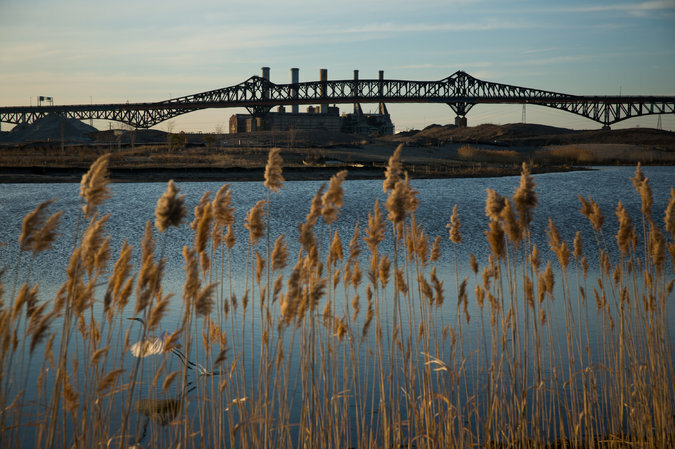 To see New Jersey from the skyway is to be engulfed by the state’s industrial trappings: smokestacks and shipping containers, a procession of truck repair shops and a smattering of solar panels, environmentally friendly but woefully outgunned. The bridge design is itself the product of bare-knuckled local politics. According to Steven Hart, the author of a book on the building of the skyway, the midsection was tugged back to earth as part of a deal engineered by Frank Hague, the mayor of Jersey City, who insisted that the span include an off-ramp in neighboring South Kearny to help the area’s economic development. “The skyway design is a classic example of engineering principles undone by politics,” Mr. Hart said in 2007. Some early admirers were undeterred. The American Institute of Steel Construction deemed it the most beautiful steel bridge the year it was finished. By 1938, the crossing had achieved sufficient renown to be destroyed by Orson Welles’s fictional Martians in his famous “War of the Worlds” radio broadcast. The skyway received intense scrutiny nearly seven years ago, after the fatal collapse of a Minneapolis bridge of the same design. Since then, the bridge has continued to age rapidly. 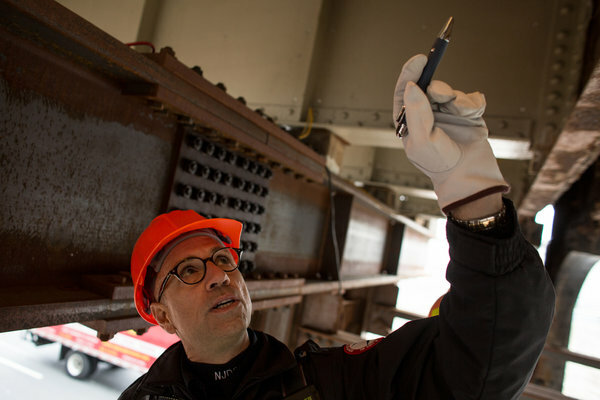 “I can break it off like a wafer cookie,” Mr. Simpson said from inside the construction lift in Jersey City, reaching for a hole-riddled sheet of steel beneath the bridge deck. Samuel I. Schwartz, the former New York City traffic commissioner, has been enlisted as a consultant in recent weeks to help mitigate the disruption to commuters and advise on the repairs. He said the fragile state of reinforcing bars and other deterioration called to mind the collapse of a slab from the underdeck of Franklin D. Roosevelt Drive in 1989, when hundreds of pounds of concrete rained down, fatally crushing a Brooklyn dentist in his car. “That has stayed with me ever since,” Mr. Schwartz said. Among the alternate routes proposed for drivers, the eastbound shoulder of the New Jersey Turnpike Newark Bay-Hudson County Extension will be converted into a third lane during the morning and evening rush. Travelers can also shift to the adjacent highway used for trucks, which are barred from the Pulaski Skyway. Officials acknowledge that the delays could be significant. “This is with the Pulaski open,” Mr. Schwartz said on Monday beneath the bridge in Jersey City, gesturing toward the traffic stopped on the truck route. Inside the trailer office of Dente Brothers Towing, which operates the Newark lot, workers braced for the shutdown’s dual impacts: It stands to hinder both employee commutes and their response time for tow jobs. “I thought that was one of the better roadways,” said Frank Dente, 50, the company’s manager. Mr. Dente turned to his team and grimaced. “We’re going to be stuck here,” he said.